When should you plant garden seeds? A week ago I started my seeds indoors for this summer’s garden. Normally the “last frost date” in this area is around May 17, although some sources day as late as June 1—nearly three weeks later than Denver, which is only about 20 miles away! But our elevation is higher and we’re in a more open area than Denver proper, which has it’s own microcosm. I’m aiming for a May 3 or 4 plant date, two weeks earlier than advised, but my hoop frames with row covers will protect the garden from late-season snow and frost. Wondering what your last frost date it? A great online source for that information is the Farmer’s Almanac web site. All you need to do is enter your town or zip code into the search box and the site will not only give you a last frost date, but also a list of vegetables, when to start your seeds and when to set the plants out—all based on your frost date. Each vegetable on the list is a link to more in-depth information on how to grow that specific veggie. What a great resource! They even have an amazing on-line garden planner that you can use for free for 30 days. Taking plant dates even a little farther, I put together an Excel chart listing only the vegetables I plan to grow. 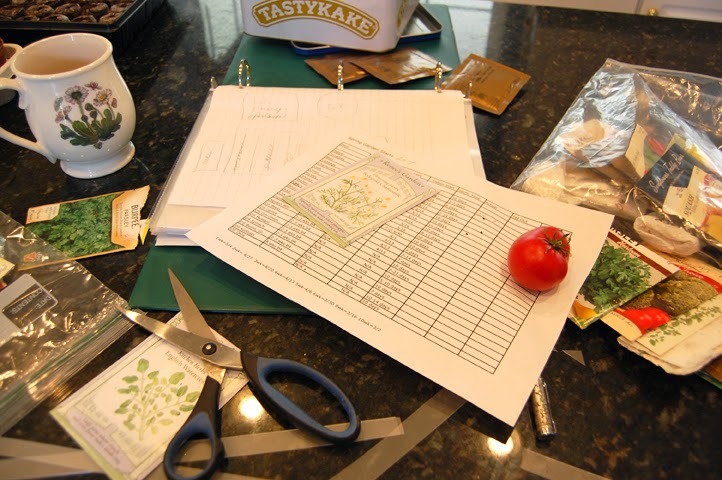 For plants that didn’t appear on the Farmer’s chart, I either used the recommendations on my seed packages, the charts that come in Park’s Seeds catalogs or looked for an on-line source such as Heirloom Seeds. Some seeds will be sown directly into the garden, on my plant date, so those went to the bottom of my chart. I then sorted the list by seed start date. I’m putting the Excel chart up here for download if you’re interested. You can then personalize the chart for your particular plants and planting schedule. If you don’t have Excel, here’s a PDF version that you can edit by hand. You’ll see a column labeled Actual. I decided to keep track on actual germination time, which can vary depending on temperature of the room in which you’re starting your seeds. 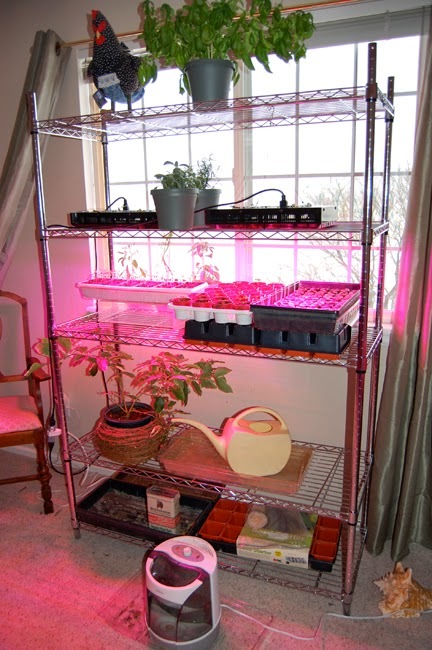 This year I moved my seed starting operation to a small upstairs bedroom with a south-facing window. It’s very easy to keep that room warm—much warmer than the rest of the house. I bought a second LED grow light to double my coverage, and added a humidifier for moisture and a little more heat, especially for those overcast or snowy days. I was very surprised to see that the first plants to germinate, chamomile and cabbage, came up within three days of planting. Their germination time is supposed to be roughly 7-14 days! In fact, everything I planted last week, with the exception of peppers (bell and Anaheim) and celery, are up and growing. I think I’ll photograph their progress every Sunday and update this post with the photos. If you’re growing your garden from seed this year, you’d better get to work now! Here is a more detailed post on starting plants from seeds from March of last year. 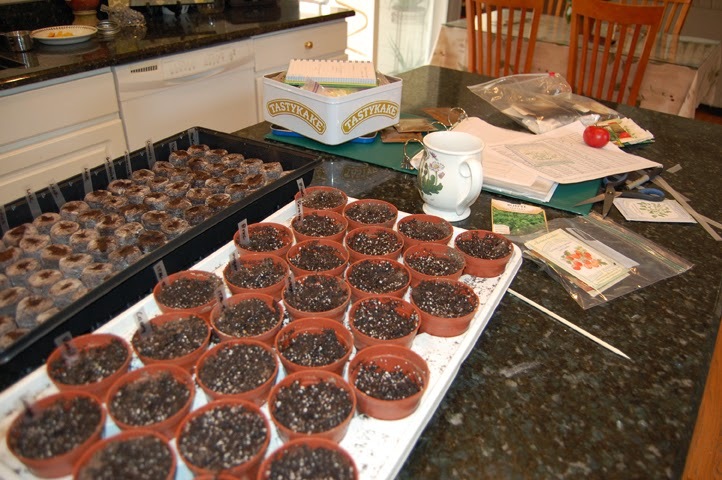 This entry was posted in garden planning, seed starting, starting seeds indoors, what's my last frost date, when do I plant seeds on March 23, 2014 by Farmer Deb.